Book 1 of an exclusive 6-consecutive-month release Amish serial novel. New York Times Bestselling author, Wanda E. Brunstetter weaves a compelling love story brilliantly mingled with an unexpected twist. Instead of experiencing newlywed bliss, Meredith and Luke Stoltzfus are faced with the challenge of their young lives. 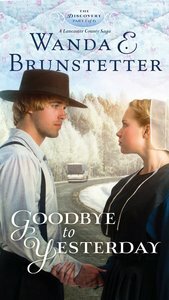 Will the faith and love shared by this Amish couple be enough to bring them back together again, against all odds? About "A Goodbye to Yesterday (#01 in The Discovery Series)"